If you’ve somehow never heard of The Up Series, and its latest installment, 56 Up, here goes: England, 1964. Fourteen seven-year-olds from various socio-economic backgrounds are interviewed for a documentary. Every seven years, they are interviewed again, presumably until they die, as part of a cinematic experiment to see if, by age seven, a person’s life’s path is pretty much set in stone. 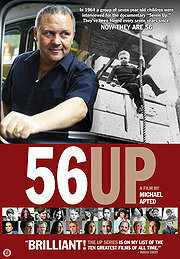 56 Up is the latest installment in Michael Apted’s documentary series chronicling the lives of a group of people every 7 years. Forty-nine years later, director Michael Apted (Firstborn, The Chronicles of Narnia: The Voyage of the Dawn Treader) and thirteen of those kids march on. This being a life-long project, 56 Up is less about making a great movie and more about using cinema as a sociological tool. In some ways, the results are predictable: the rich kids are still rich, and everyone else is struggling, but getting by. On the other hand, Neil, who was homeless in his 30’s, is now fighting for the common man as a local politician and public figure- an inspiring twist of events. He still struggles with personal issues and frustrations, but he’s doing okay- a common theme during 56 Up. Our stars may not be living their dreams, but they’re comfortable with who they are and where they’ve ended up. Most of our characters have been through a divorce, yet many of them find themselves in a new, seemingly healthier, relationship. Like real life, that’s about as close to a happy ending as one can expect. The one thing this series can be faulted for is its refusal to go beyond the obvious, boilerplate questions. By sticking to the general details of each person’s life, and never probing deeper, Apted’s interviews are always blander than they should be, given the unique potential of this project. If the filmmakers are trying to remove any personal bias from the series, they’re succeeding- but at the expense of the story, which after half-a-century remains on the level of “somewhat interesting television” rather than “timeless art.” Limited by its dry, BBC-documentary style, The Up Series is always watchable, but rarely compelling. As much as they may whine, however, they keep coming back for more. If The Up Series teaches us anything, it’s that rich or poor, we all ultimately value the same thing in life: our stories. Long after these folks expire, the tales that they tell will be there for future generations to soak up. What can be more important than that? DVD extras include the obligatory commentary track, as well as an interview with the director by the late Roger Ebert recorded in 2006. Oops! You’ve mistakenly identified Neil as Paul twice in your review. 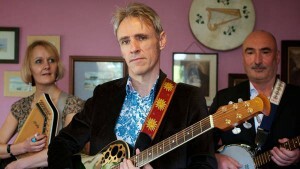 Paul lives in Australia while Neil is the “lonely unhappy” man who “shares is resentment towards the audience”. Yikes! Noted and corrected! Thanks!